Airtel offers 84GB data along with the unlimited calls to all networks for 84 days. It mean, by using this offer, user can get benefit of 1GB data per day offer till 84 days under the plan of Rs. 399. Also, the user can get unlimited local and STD calls to all networks in India. The competition between the telecom sector in India is becoming large on day by day after the launch of Reliance Jio at the end of 2016. 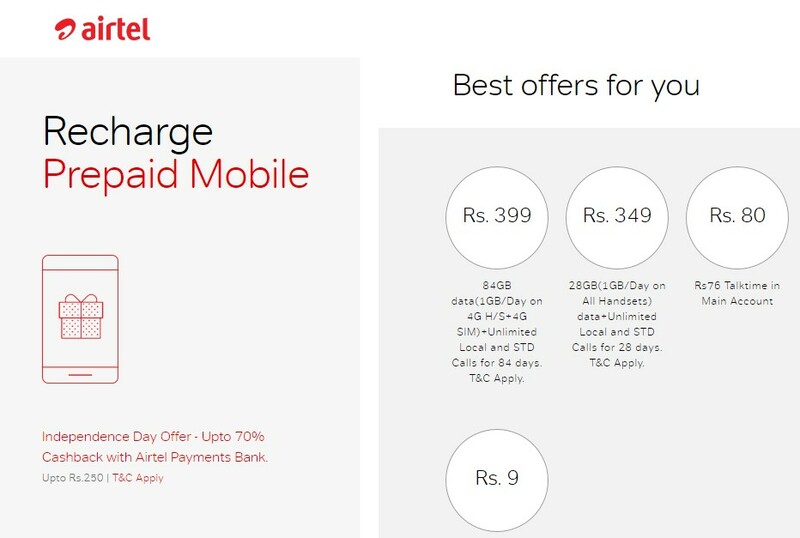 One of India’s biggest telecom company Bharti Airtel has introduced an new offer which carries price plan as similar to the Reliance Jio’s price plan. This new offer is only available for the prepaid users of Airtel in India. Also, this plan is only support on a 4G handset and SIM. This offer is available on select customers, it is not a common price plan. Also, it is not valid for special, commercial or enterprise purposes and can’t be clubbed with any other plan, it added. Visit the official Airtel website (or) Mobile app and check it with your Airtel mobile number. Users who like to recharge on this plan will also get unlimited calls (both local and STD) on all networks for 84 days. All the telecom sectors in India are trying their best to hold their existed customers and also trying to get new customers. It is tough time to the companies because of the Reliance Jio arrival. Mukesh Ambani’s company is keeps unveiling new offers to their customers. Recently, they announced a low-cost 4G feature phone called JioPhone. It will be reached soon to all the customers who all will purchase on September 2017.